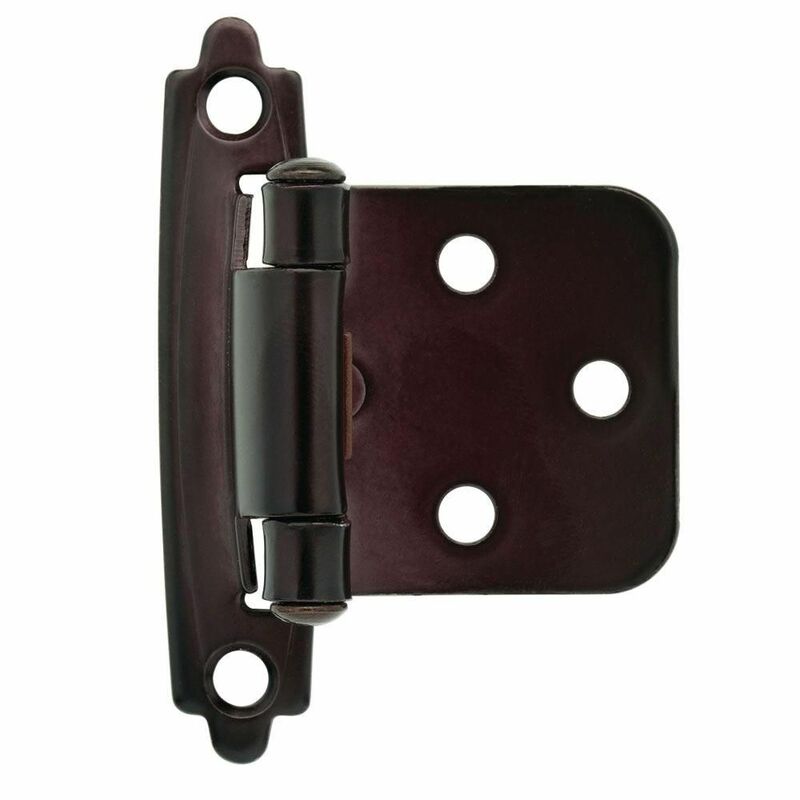 The Liberty Self-Closing Overlay Hinges are steel self-closing hinges with a bronze finish. Installation is easy with the enclosed hardware. Instructions included for easy installation. With its sturdy steel construction and traditional face frame, the Liberty 3/8 in. Satin Nickel Inset Hinge Without Spring is ideal for durable cabinet door mounting. A simple change can make a huge impact on the look and feel of any room. Change out your old hinges and give any room a brand new feel. Complement the interior accents of your kitchen or bathroom with these elegant Polished Brass Self-Closing Overlay Hinges from Liberty. These traditional hinges feature a trend forward finish that provide the finishing touches for your complete room makeover. The use of common decorative hinge hole patterns allow for easy installation. Complement the interior accents of your kitchen or bathroom with these elegant Venetian Bronze Self-Closing Overlay Hinges from Liberty. These traditional hinges feature a trend forward finish that provide the finishing touches for your complete room makeover. The use of common decorative hinge hole patterns allow for easy installation. Self Closing Overlay Hinge The Liberty Self-Closing Overlay Hinges are steel self-closing hinges with a bronze finish. Installation is easy with the enclosed hardware. Instructions included for easy installation. Self Closing Overlay Hinge is rated 3.1 out of 5 by 28. Rated 1 out of 5 by Connie from Color is definitely BLACK!... Color is definitely BLACK! Rated 2 out of 5 by BJTN from Disappointed. I ordered in-store pickup and it was 2 days late arriving per the original date I w... Disappointed. I ordered in-store pickup and it was 2 days late arriving per the original date I was given when I placed my order. However even more disappointing is the fact that they didn’t look a thing like oil rubbed bronze should look. They were just black. The only copper that was visible would not have been seen so what was the purpose in labeling these oil rubbed bronze? Rated 1 out of 5 by NJB from The oil rubbed bronze hinges were ordered but they appear... The oil rubbed bronze hinges were ordered but they appear to be black. The contractor had all 48 installed before we saw them. Otherwise they would have been returned. Rated 2 out of 5 by Edward from Disappointed with the color. It’s not really rubbed bronze as... Disappointed with the color. It’s not really rubbed bronze as much as a shiny black.